Turmeric, a plant stem that looks a bit like ginger, has gotten a bit of a reputation as a super spice. Research shows that small amounts of this vibrant-colored orange-yellow spice may help alleviate aches and pains associated with arthritis, among other benefits. Try this delicious “shot” to get your daily Rx. Bottoms up! Whisk together all ingredients in a saucepan and simmer for about 5 minutes. Let cool slightly—and enjoy a 1-ounce shot! Serve warm, room temperature or cold. Pour leftovers into 1-ounce ice cube tray and freeze. Once they’re frozen, you can pop them into a zip-top bag for easier storage in the freezer. Defrost 1 at a time and enjoy as a daily Rx. 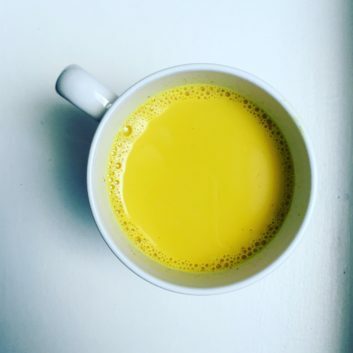 Start your day with a healthy dose of the super spice by whipping up my Turmeric Pineapple Smoothie.